Do you know your MCZ from your SAC? Does it matter to me? When I go for a walk on the beach at Lee on Solent; or sail my boat into Keyhaven, are there things I should know? The short answer is ‘yes’ but identifying protected zones, and the regulations that attach to them is far from easy. The eco-establishment spend their time talking a language that is difficult to understand, but they are talking about our rights, and actions that now (or in the future) could lead to us being prosecuted or fined. So we need to know. As a first step, here is a simplified explanation of how UK and EU legislation fits together. The blue items in the diagram are inspired by Brussels, and the rest are the way in which the UK implements the Directives and tries to meet its own aspirations. SSSI (Site of Special Scientific Interest) : The oldest of the designations, SSSIs depend on an agreement between Natural England and the landowner on the way in which Potentially Damaging Operations are to be managed. The area of all marine SPAs and SACs between high and low water has been designated as SSSI. MCZ (Marine Conservation Zone): The newest of the designations created by the recent Marine Act. It plugs a gap because the SSSI cannot be extended below low water springs (no single user-landowner). The effect of social and economic activity is taken into account in these zones, but this has recently been restricted to the period of designation only. Once designated, all aspects can be regulated. The Act makes provision for wardens, and prosecutable offences leading to fines and more are incorporated within the Act. All regulators such as Local government, Harbour Authorities, Coastguard, Police and Environment Agency (advised by Natural England) are required to exercise their existing powers to further the aims of designation – i.e. to protect specified habitats and species to maintain or restore a favourable condition. By an accident of history, the West Solent is technically open sea, so there are few regulators with powers to regulate operations in the area. So far it is not clear how this will be handled. 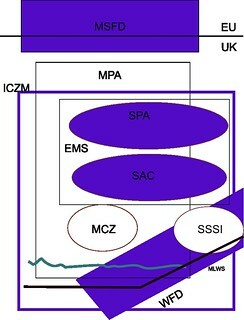 EMS (European Marine Site): A UK administrative “envelope” to contain the European SPA and SAC Directives. The associated Habitats Regulations place an obligation on all statutory bodies (known as Relevant Authorities) to use their existing power to further the aims of the Directives. The regulations permit the Relevant Authorities to generate a Scheme of Management for the EMS. For the Solent this is known as SEMS (Solent European site Management Scheme). MPA (Marine Protected Area): Another UK administrative “envelope” comprising EMSs, plus MCZ and wetland areas designated under the international Ramsar convention. While there seems to be an obligation for the conservation bodies (such as Natural England) to periodically report progress to parliament, there has been no serious attempt to explain to the public what the sites are designated for, how to identify the areas, and what the public should and should not so in such areas (which may vary with the season). This would eliminate the need for the public to understand the complexity of the underlying designations. So far this is an opportunity missed. WFD (Water Framework Directive): A Directive mainly aimed at improving the status of European river catchment areas in terms of ecology and water quality from source to well out to sea. In the UK the Directive is largely implemented by the Environment Agency using a variety of regulatory regimes. Clearly WFD areas overlap the EMS areas, and the interaction between them is at best fuzzy. SPA (Special Protection Area for Birds): One of the oldest European ecology Directives. Virtually every estuary in the UK is designated as either SPA or SAC (or both). Designation depends on there being more than 1% of one(or more) of the European population of the listed species (which begs the question that if you make the area big enough it is bound to contain 1%!). In the UK estuary designation has been by drawing a line across the mouth of the estuary, unlike the rest of Europe which designates only shorelines. The European Court has confirmed that the UK is right, but so far no other EU country has complied. MSFD (Marine Strategy Framework Directive): The legislation has now got so complicated that this ‘Directive about Directives’ has become necessary so that administrators can begin to understand the interrelationships. Only eco-professionals need concern themselves with this. Maybe another day we will try to define the ‘eco-establishment’!